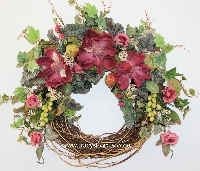 Dark mauve magnolia are the focal point of this lovely wreath. Surrounded by soft green ivy, berries, light mauve roses, cream flowers and honeysuckle. 23" in diameter, 8" in depth. Approx. ship time: One to three weeks. 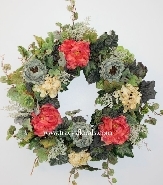 Inspired by French Country decor, this unique wreath is overflowing with salmon peonies, cream hydrangea, and robins egg blue tea roses. Soft green trailing ivy and cream berries complete the look. A full 22" in diameter. Approx. ship time: One week.